Your iPad and MacBook could soon become best buddies. 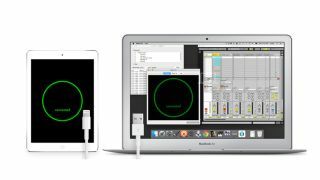 Secret Base Design's Music IO is the latest app to offer MIDI over USB between iOS and Mac OS X using just a Lightning or 30-pin cable. It promises to send and receive data using CoreMIDI-compatible apps with no perceptible latency or jitter, and can deal with SysEx dumps, too. It works in conjunction with a free companion app for the Mac which can be downloaded from the Music IO website and will soon be available on the Mac App Store. Future updates are set to include audio over USB and support for multiple iOS devices per Mac. Music IO is available now from the Apple App Store at the introductory price of £2.29/$2.99.